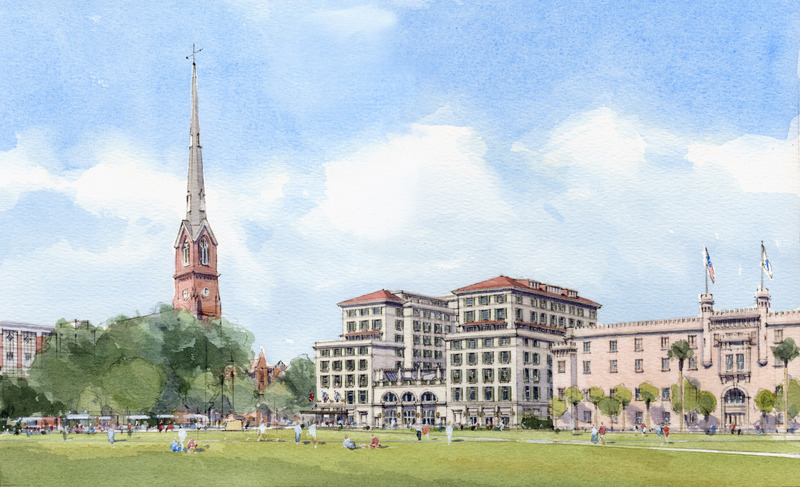 CHARLESTON, SC – Hotel Bennett, the South’s grandest new hotel, will open in fall 2017 overlooking Charleston’s iconic and historic Marion Square. Years in the making and located on King Street – Charleston’s most prominent address – the hotel perfectly blends unparalleled luxury with an unmatched setting. Hotel Bennett, which is under construction, will be among the most significant lodging developments ever built in the Holy City and the State of South Carolina. It will feature 179 luxurious guestrooms and suites, a signature restaurant with stunning views of Charleston's famed park, and a stylish bar and lounge. The hotel will also include a spectacular rooftop pool with cabanas and bar, a luxury spa, a French patisserie, and a variety of grand event and flexible meeting spaces. With numerous businesses, restaurants and a 1000-seat music venue, Michael Bennett has been instrumental in the redevelopment of King Street. In fact, in Charleston Magazine’s recent “40 Movers and Shapers” story, he was named as the King of King Street. The hotel is named for his family, which owns the property and is developing the world-class hotel. The Bennett family’s roots in Charleston trace back generations and Michael’s father once shined shoes opposite the hotel site during the Great Depression. His 94-year-old mother, Virginia, still works alongside him five days a week. Prominently located on Marion Square, the hotel’s historic site formerly housed the original west wing of The Citadel, South Carolina’s Military Academy. Most recently, it was home to the Charleston Library. Today, Marion Square, the most famous green space in the city, serves as a central gathering location for world-class events, including the Charleston Wine + Food Festival, Charleston Fashion Week, the Southeastern Wildlife Exposition and the highly popular Charleston Farmer’s Market. Serving as a gateway to numerous landmarks, attractions and neighborhoods, Marion Square is also where one of the city’s original gates was located and a remnant of one of Charleston’s colonial walls, called the Horn Work Battery, is still preserved on the west side of the park. The Washington Light Infantry, owners of Marion Square, have worked with Michael Bennett on the creation of this grand hotel. Hotel guests will arrive at a magnificent entrance and be greeted with the warm and gracious hospitality for which Charleston is renowned. A sweeping lobby will serve as a gathering place for visitors and locals alike. The lobby bar and adjacent two-tiered restaurant open onto dramatic terraces overlooking Marion Square, offering an outdoor dining experience unlike any other in Charleston. Hotel Bennett will also feature Charleston’s first classic Ladies Bar, featuring an etched-mirrored ceiling and reclaimed pink marble from the former Charleston Library for its floor, bar and table tops. This sophisticated bar will be an elegant addition to Charleston’s hospitality landscape. Stylish guest rooms and suites will include high-quality, custom furnishings which reflect the authenticity of the local and cultural surroundings. More finely appointed than traditional luxury hotel guestrooms, they will offer elegant bathrooms with designer pedestal tubs, separate showers, luxurious bedding and locally inspired artwork. Many rooms will boast balconies with spectacular views of Marion Square and King Street. The hotel will also feature an exclusive Concierge Club for guests who desire the most personalized Charleston experience. The Club, which has an outdoor terrace with views of King Street, will serve creative food presentations throughout the day and its dedicated staff will assist with hard-to-obtain tickets and reservations at the city’s famed restaurants. Guests of the hotel will receive preferred reservation access to Bennett Hospitality Group’s acclaimed collection of nearby restaurants and theater, including The Victor Social Club, Michael’s on the Alley, Vincent Chicco’s, Rue de Jean, Coast, Virginia’s on King and the Charleston Music Hall. Drawing on the inspirational venue, the hotel’s signature spa will create an urban oasis for guests with treatments that incorporate the area’s maritime surroundings. It will be considered the city’s finest spa experience with unique programming such as Skyline Yoga, as well as radiance and fortitude treatments focusing on heart health. The spa will even provide a true King Street shopping experience for those browsing the exclusive retail offerings. With the finest views in Charleston and one of the most iconic hotel bars in America, the rooftop experience will feature an elegant, heated pool at its epicenter. By day, the pool, bar and terrace will provide a peaceful retreat for the hotel’s guests, serving chilled drinks and creative, healthy fare. In the evening and infused with sultry breezes and smooth music, it will become the city’s coolest new gathering place. Hotel Bennett will also offer corporate groups and destination weddings the most luxurious new event spaces in Charleston in which to meet and celebrate, including the Grand Ballroom, elegantly appointed boardrooms and, of course, the spectacular rooftop. Over the past decade, Charleston's popularity as a travel destination has boomed. In 2016, it was ranked as the top city in the world to visit by readers of Travel + Leisure, one of many accolades recently awarded to the Holy City. In recent years, the city’s chefs and restaurants have also garnered an incredible number of honors, including multiple James Beard Foundation awards. Bennett Hospitality will collaborate with highly acclaimed Salamander Hotels & Resorts to operate the hotel, leveraging both Michael Bennett’s vast knowledge of the Charleston area and the Salamander team’s experience in positioning luxury destinations in the group and leisure markets. Bennett Hospitality’s management team is led by Managing Director Marty Wall, a veteran luxury hotelier who has held several senior leadership positions, including nearly two decades with Four Seasons Hotels and Resorts. Salamander was founded in 2005 by renowned businesswoman Sheila C. Johnson, who is also well known as the vice chairman of Monumental Sports, the owner of the NBA’s Washington Wizards, the NHL’s Washington Capitals and the WNBA’s Washington Mystics. Salamander’s leadership team includes several executives with an intimate understanding of the Charleston tourism community, including its President Prem Devadas, who led Kiawah Island Golf Resort for over a decade and opened the world-renowned Sanctuary at Kiawah Island hotel. Devadas is also a former Chairman of the Board of Governors for the Charleston Area Convention & Visitors Bureau. The decision for Bennett Hospitality and Salamander to team together on the project was lauded by Charleston’s current and past leaders. Hotel Bennett has entered into membership of the Preferred Hotels & Resorts Legend Collection, which represents renowned properties that feature the finest accommodations coupled with attentive, engaging, and exclusive personal service. The hotel’s architects of record are Buck Lindsay of Lindsay Pope Brayfield Clifford & Associates in Atlanta and Chris Schmitt of Schmitt Walker Architects in Charleston. The hotel’s design architects are Fairfax and Sammons Architects of New York City. Balfour Beatty Construction, the second-largest hotel contractor in the U.S., is serving as the project's general contractor, while the interior designer is Design Continuum, Inc., from Atlanta. Founded as the Bennett Hofford Company in 1983, Bennett Hospitality is today one of the largest locally-owned companies in Charleston, S.C. The company is a multi-faceted, full-service real estate and development company, as well as a hospitality, restaurant, and asset management company. The company owns 18 hotels, eight restaurants and a catering company in four states. Projects are developed, constructed and managed in this framework and range from award-winning resort developments to the re-design and re-development of two city blocks, including six restaurants, a 1000-seat music hall and two hotels in downtown Charleston. For additional information, visit www.BennettHospitality.com. Salamander Hotels & Resorts is a privately owned and operated company based in Middleburg, VA, just outside Washington, D.C. Founded by entrepreneur Sheila C. Johnson in 2005, the company has a luxury portfolio that includes the stunning Salamander Resort & Spa in Middleburg, a 340-acre equestrian-inspired property near Washington, D.C.; The Henderson, a 170-room grand beach resort in Destin, FL; NOPSI New Orleans, a new 217-room luxury historic hotel conversion in New Orleans opening in spring 2017; and Hotel Bennett, a 179 luxury hotel in Charleston, SC, opening in fall 2017. The company also operates the Salamander Golf Collection, including Innisbrook Resort in Tampa Bay, Reunion Resort in Orlando and Hammock Beach Resort in Palm Coast, FL. For additional information, visit www.SalamanderHotels.com.